How to get there: This is the second summit along the Meneseggi ridge traverse. This route first climbs Harevollnipa. Route description: From the base of Harevollnipa, the route descends on the east side. A large cornice on the very top may cause difficulties here. It is therefore recommended to bring a rope for a possible rapell in this spot. Continue down, but do not loose too much elevation. Aim for lake 922, marked on the M711 map. 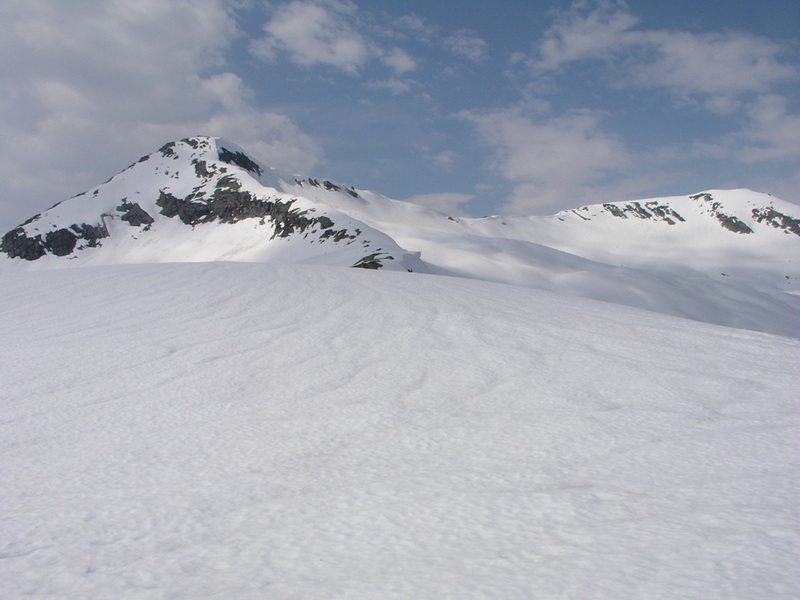 From here, ascend north to reach the saddle between Storaskrednipa (1200m) and Hardbakk (1440 m), keep towards the left (Hardbakk side) and cross into the bowl on the north. 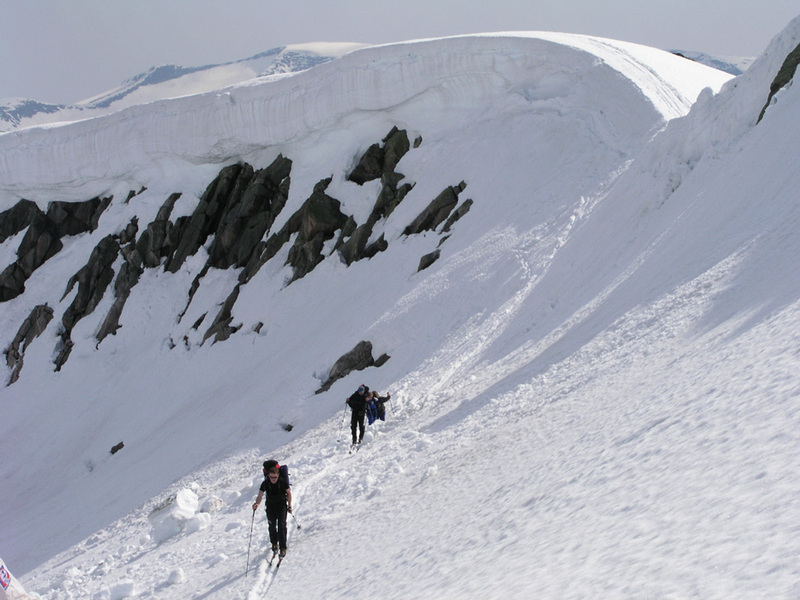 This ridge may also have a cornice, however, one normally finds a route across that can be skied. Ascend west and gain the main ridge north of Hardbakk in the saddle south of the Saueggi summit. One can ski up this route, the steepest part being near the top. 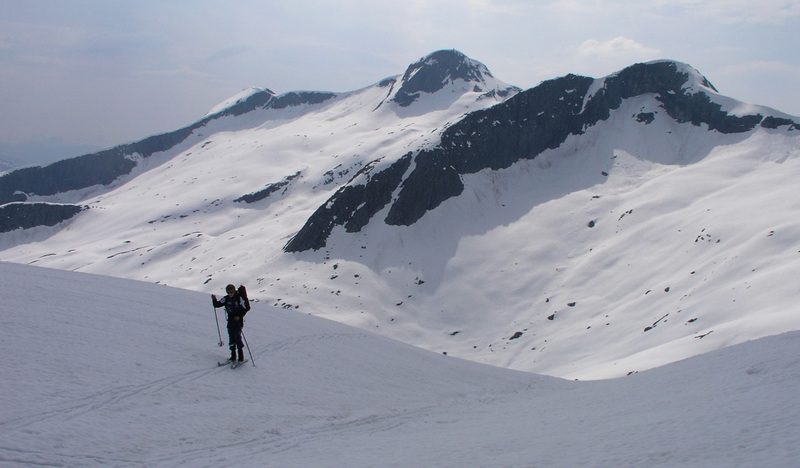 After reaching the saddle, the skiing along the high ridge to the Saueggi summit is very nice with great scenery all around. 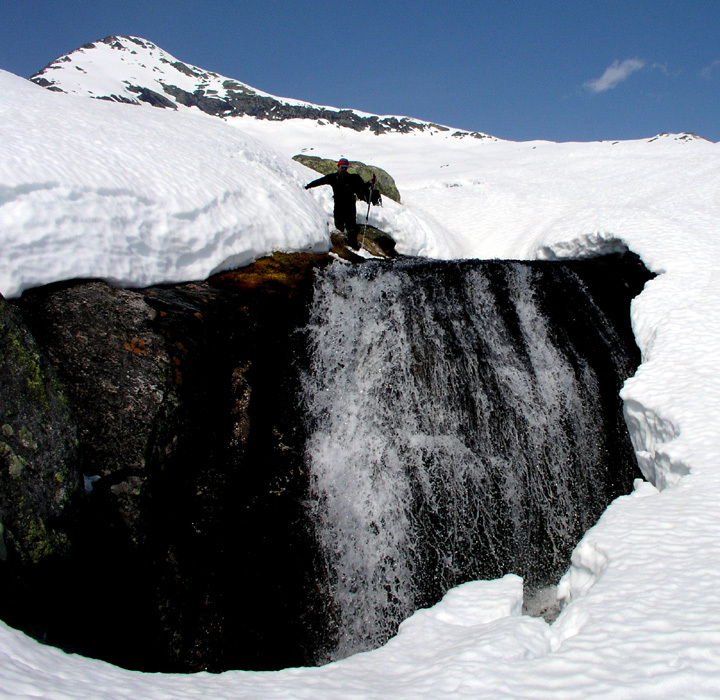 The Meneseggi traverse continues to Melsnipa. 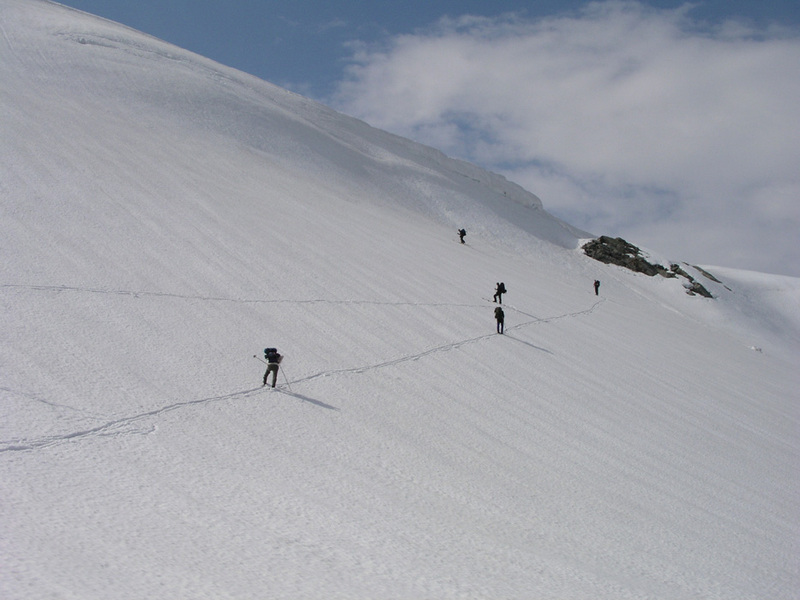 Comments: After climbing Harevollnipa, we descended back down to its base and crossed down the cornice on foot. The rope was not needed, but Bjørn did a good job with a shovel, preparing a few nice steps down the steeper part. We had lunch near lake 922 before a new uphill across to the bowl below Saueggi. This route was good skiing all the way. 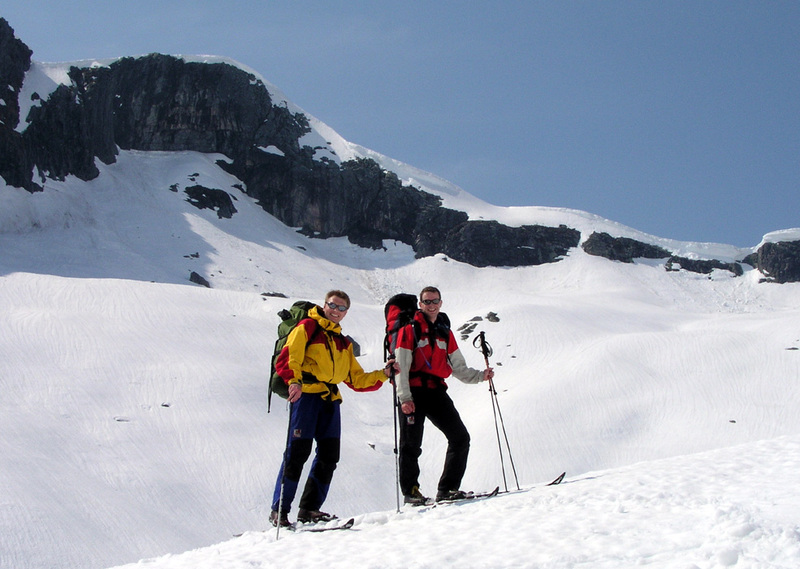 However, the terrain is steep enough that possible avalanche hazards may exist. Any party should be aware of the snow conditions before attempting this route. 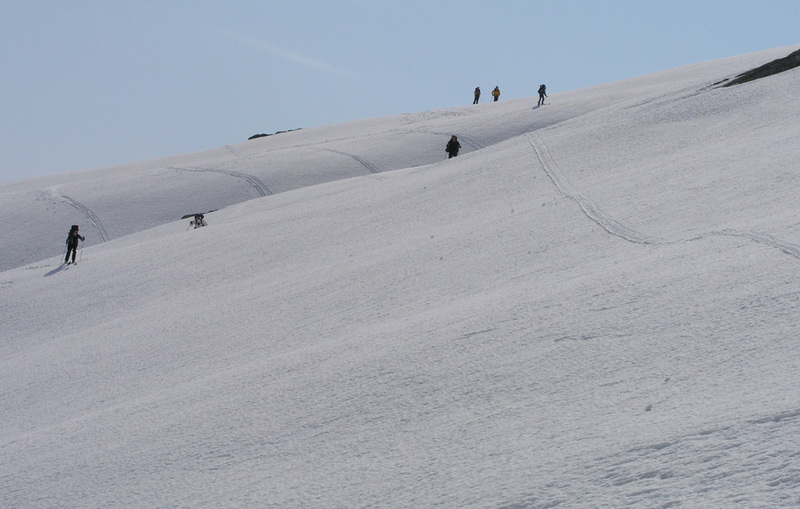 Downhill skiing from Harevollnipa to lake 922. We will have lunch here. Near the ridge connecting Storaskrednipa and Hardbakk. Harevollnipa and the route down is behind us. The ridge connecting Hardbakk (left) and Saueggi (right). A good place to cross, moving north into the bowl below the Hardbakk to Saueggi ridge (crossing the Storaskrednipa to Hardbakk ridge). Ascending traverse in order to gain the saddle between Hardbakk and Saueggi. The route crosses just above the rock.